You might remember [Janne]’s IKEA cluster. Now he’s got a couple of dream rigs in mind, so he started doing 3D renderings of them. 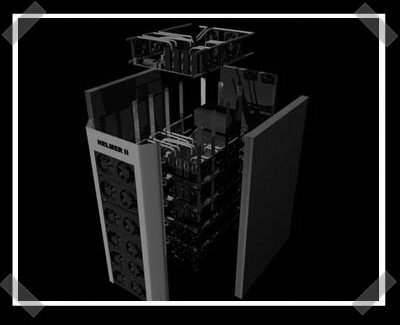 Helmer 2 is designed to contain 24 video cards attached to six motherboards with quad core CPUs. (AMD has even taken enough interest to send him some cpus to get started) The rendering really comes in handy for designing the custom copper heat pipes and the aluminum cooling fin enclosure. Still bored, he put together a rendering of a 4 PetaFLOP machine using 2160 video cards. Update: The Helmer 2 link is fixed.